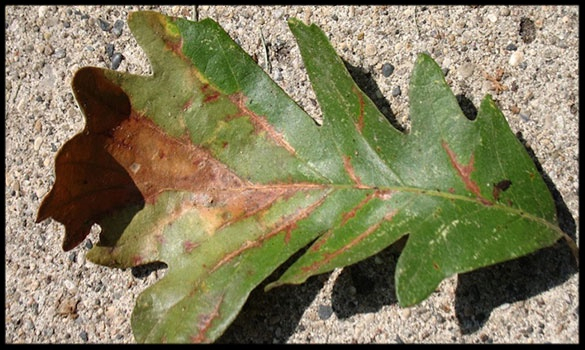 Bur Oak Blight (BOB) has been a hot topic as of late in the Iowa Great Lakes. Below you will find information regarding a public meeting sponsored by the Dickinson County Extension office. Thank you for your support of the Iowa Great Lakes Association and explore this website for more information on BOB. Dickinson County Extension is partnering with the Department of Natural Resources and the Dickinson County Conservation Board to bring Dr. Jesse Randall, Iowa State University’s Forestry Specialist, to the lakes area to speak on Bur Oak Blight that is affecting oak trees in the area. Dr. Randall will be at Gull Point State Park Lodge on Monday, September 26th, from 6- 7:30 pm to discuss Bur Oak Blight, its effects on the trees, and treatments. This discussion is open to the public and there is no fee to attend. Gull Point State Park is located at 1500 Harpen Street, on the West side of West Okoboji.